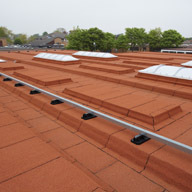 The refurbishing of flat roofs requires a different approach than new build. There are many considerations, including existing build-up, condition analysis, roof access and usage to be considered prior to specification that every architect will want to be aware of. This seminar will take you visually through many of the challenges encountered on flat roof refurbishments. This covers site surveys, types of flat roofs, design considerations, flat roof refurbishment options and site expectations.